Argentinian folk power metallets Skiltron have just revealed the cover and tracklist from their upcoming album “Legacy of Blood“, which will be released by TrollZorn Records on September 30th 2016. 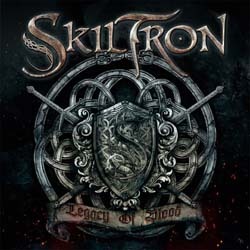 ”Legacy of Blood” is the fifth studio album from Skiltron, keeping the classic sound of the band, which is already its trademark. Metal and bagpipes blend once again in a powerful mix, honouring the ancestors and pleasing the hordes! It will be available as a limited digipak CD edition including bonus song, as standard jewel-case CD and in digital formats. The cover artwork is by Aldo Requena – Hammerblaze Studio.